Your product can get millions of signups or downloads, but it counts for little if you can't get new users past the first few hurdles. Entrepreneur, author and investor Scott Belsky calls this your product’s “first mile”, and he’s seen first hand what it takes to get it right. Following a stint at Goldman Sachs, Scott founded the online design community and portfolio platform Behance, acquired by Adobe in 2012. Meanwhile, Scott was an angel investor for a some of the world’s biggest brands, including Warby Parker, Uber, Pinterest and Periscope. He joined Benchmark Capital, where he’s currently a Venture Partner, in February 2016 and advises companies that sit at the intersection of design and technology. In my chat with Scott, we discuss how to onboard new users successfully, how to keep your product simple and why not all customers are created equal. If you like what you hear, check out more episodes of our podcast. You can subscribe on iTunes or grab the RSS feed. As the co-founder of Behance, Scott has seen more than his fair share of portfolios. What makes a good one? It tells a story and takes someone from ideation through fruition. With so much technology being commoditized, Scott sees the interface as where your product or service distinguishes itself. In the first 15-30 seconds of every new customer’s experience of a product, they are lazy, vain and selfish. This is your product’s first mile, and it’s something you must consider early in the design process. The key to keeping your product simple over time is to stay empathetic to new users and consistently optimize and revisit your product’s first mile. There’s an intuitive logic that you want every customer you can get, but in reality, different customers will better serve your business at different stages. Geoffrey Keating: Scott, thanks for joining us. You’re currently a venture partner at Benchmark Capital after a long career in product, which is quite interesting. Could you give us the CliffsNotes versions of how you got to where you are today? Scott Belsky: As an undergrad I studied both design and business. I wasn’t really sure which avenue to take, although business always had a real pull. Then I took a traditional Wall Street internship in 2001 and a job full-time in 2002. That was a great experience, but I wanted to go back to my interest in design and the creative industry. I was obsessed with this one problem – how do you organize the creative world? How do you foster attribution and transparency in one of the most disorganized communities in the planet, but also an industry that really changes the quality of life for all of us? That’s my mode right now. I’m investing in new companies as a seed investor, an extended member of the Benchmark team, and helping get a couple new companies off the ground as well. Geoffrey: Behance is very focused on helping creative people get their ideas out there. Did you always identify yourself as a creative person? Scott: I did. Inside I always thought, “I wish my skills are better,” when it came to actual design and some of the things I found interesting in college. I just never pursued that career path as a profession. The closest I could get was helping organize designers, and as a leader of different companies or teams, helping empower design in the process of building a business and then the process of crafting product. That’s a perfect overlap of my interest and why I spend so much time in it. Scott co-founded Behance in 2006. Adobe acquired the product in 2012. Geoffrey: Given your work on Behance I have to ask, what makes a good portfolio? Scott: A good portfolio tells a story. The problem with portfolios is that every portfolio is a lie. Every portfolio includes work that not only you did, but other people contributed to – whether it was the photograph you used, a typographer who made the font you used or an illustrator you partnered with. Every portfolio really represents a collection of people contributing and working together towards something. What actually matters in a portfolio is the problem you are trying to solve – what you actually did as part of that project and the story. Did you go back and forth? Did you have a few ideas at first and then you ended up picking one? That’s the type of thing that helps someone determine who they want to work with as a partner – how they went through the story, how someone thinks through an idea to fruition. Geoffrey: Do you find that designers are too focused on showing the final, polished elements of their design rather than the rough sketches? Scott: Yeah, one thing I would see on Behance that I didn’t like was only showing the polished end or only taking little snapshots of something like a drop shadow at the corner of a product that you did. In some ways you’re making your work look better than it may have been, because you’re not willing to show the whole thing. That’s another thing that a lot of design communities are guilty of. Allowing designers to show a little hint of something without really showing the full context, which is actually what really matters. Design is only effective in the context of what it’s being presented in. Geoffrey: Do designers spend too much focusing on things like the interface rather than solving the actual underlying problems? Design is only effective in the context of what it’s being presented in. Scott: At best designers are always grounded by a problem and are not taking design direction in terms of what they should be doing design-wise, but rather direction in where they’re not answering or solving the problem effectively. The interface is where a lot of great problems are solved, but the other thing that designers are liable to do is borrow things that work for other products. They put something into theirs without thinking about the context and all of the other aspects that user’s experience and what needs to change to support that addition they made. That’s why there’s no shortcuts to design. That’s one of the reason why I tend to have a problem with open source or crowdsourcing spec contests for design, and engaging a designer in one particular part of a project without really engaging them in the whole course of the project. Design is start to finish. Geoffrey: You wrote in 2014 that design is becoming a commodity. This is something our director of design, Emmett, would certainly echo. It’s 2017 now. Do you now this trend has worsen? Scott: I don’t know if I feel that it’s really becoming a commodity in the sense that the competitive advantage for most businesses is design. Therefore, bringing designers in-house, empowering designers, making sure that designers have a seat at the table in the full decision-making process, partnering designers with product leaders, and making designers product leaders themselves rather than having them treat it as like an internal or an external agency, is super important these days. Bad design is becoming commoditized in a sense that it’s more accessible. You can just rip someone else’s piece off or get something done on a crowdsourcing site or something. Great design in my belief is more of a competitive advantage these days in technology than the actual technology. So much of a tech stack is now being commoditized. You can just roll in with a few lines of code. There are great services for payment, tracking, analytics, shipping and everything else. Those things that used to be the competitive advantage of companies trying to change industries are now more commoditized. Now it’s really the interface itself where you distinguish your product or service. Geoffrey: You mentioned designers’ seat at the table. In the companies you advise, what do you encourage designers to do with that seat at the table? Scott: First of all you have to help frame the internal objectives through design. The business plan means nothing when it’s tucked away in a Microsoft Word Doc or Google Doc. What makes a business plan and a set of milestones come alive is when some design is applied to it. Then that plan, that strategy, is merchandised to the rest of the team in a way that they’ll relate to, which is what design is all about. Internal communications can be reinvigorated by a designer with a seat at the table. Then the second thing is to make sure that these endless debates about strategy, product, pricing, etc start with mockups. So much debate can be prevented by showing something rather than everyone telling each other their opinion. Designers can really thrive by making sure people start with something visual that they can relate to. Putting up straw mans that people can engage and debate around rather than these hypothetical questions. Geoffrey: You published a great piece on Medium last year, “Crafting the First Mile of a Product”. It’s about the temptation of many startups to focus on existing users rather new ones. What exactly is the first mile and why are people tempted to overlook it? Scott: Once someone comes to your product, downloads it, signs up, joins and does a few key things that shows them the longer-term potential of your product in their life, you’re golden. That’s all about keeping someone engaged and building a roadmap for the coming years of features to better serve the customer – that’s actually where everyone spends the majority of their time, but it’s further down the funnel from what customers go through initially. That first mile of: what does the tour look like? What is the copy? What is the onboarding process like? What questions are you asking or aren’t you asking? What’s the default? What do you see first? What’s the first action and how are you oriented around why you’re there and what you’re going to do next? That is actually what matters for a successful product. It’s easier to get someone to give you faith in the roadmap once they’re further than that, but to get that far is where most companies struggle. In ultimate irony, that first mile of the user’s experience tends to be the last mile of the team’s experience when it comes to building the product. It’s really toward the end where people ask, “What should the tour be and what copy should we slap in there? Let’s just use the form fields that we think are logical.” It doesn’t make any sense. It’s all about the first mile. In the first 15-30 seconds of every new customer’s experience, they are lazy, vain and selfish. The other psychological undertone there is my conviction that in the first 15-30 seconds of every new customer’s experience of a product, they are lazy, vain and selfish. They’re lazy in the sense that they’re not willing to take time to read or learn anything. They’re vain in the sense of, “Gosh, life is short. I’m busy. If I’m going to engage in this new thing, it better make me look good.” If it’s an enterprise product, it better make them look good to their colleagues. If it’s a personal product, it better make them look good to their friends or professionally online. Then selfishness is, even if this product is something that helps my team be more productive or is good for the world or is good for a political movement or something else I believe in, at the end of the day for the first 15-30 seconds, I want to make sure that this product solves one of my problems, now. It’s one of these grounding things that we must realize as product makers. We can’t believe that people will have a relationship with us until they get through that 30 seconds. We can’t sell them on the long-term vision or get them to invite all these people to make it worth their while. It needs to serve them now. When you ground the decisions you make in that first mile of the product experience for a new user, it triggers things like, “Maybe we shouldn’t tell them or even show them. Maybe we should just do it for them with a template, with a default field completed.” You start to think about differently about little things like that. Geoffrey: The first mile is really successful when new users reach what you call “the zone.” They’re fully onboarded and really finding success within your product. Once users have actually reached that zone, how do you make sure that they stick around? Scott: That’s where the core features and empathy come in. One of the mistakes that companies are liable to make at that point when you’re keeping your community or your active customers engaged is you become passionate as a team about ideas for the product and then you act upon that passion. In fact, you should become more empathetic to the customers and the new modern problems they’re facing and then build a roadmap based on where that empathy leads you, rather than where your passion leads you. It’s a very important thing. Some of the most impressive teams that I’ve come across always have customers coming into their office. They’re always shoulder to shoulder with customers, working through their products, watching them use it, empathizing with the struggles and the frictions they’re encountering and acting upon those when it comes to prioritizing the roadmap. Geoffrey: Who is really nailing this first mile right now? Scott: Products like Instagram have certainly figured this out. Products that have proven that they can break through that 500-million-user ceiling. In terms of new products, some of the messaging products like Telegram have very smooth onboarding. Slack is especially good at this. 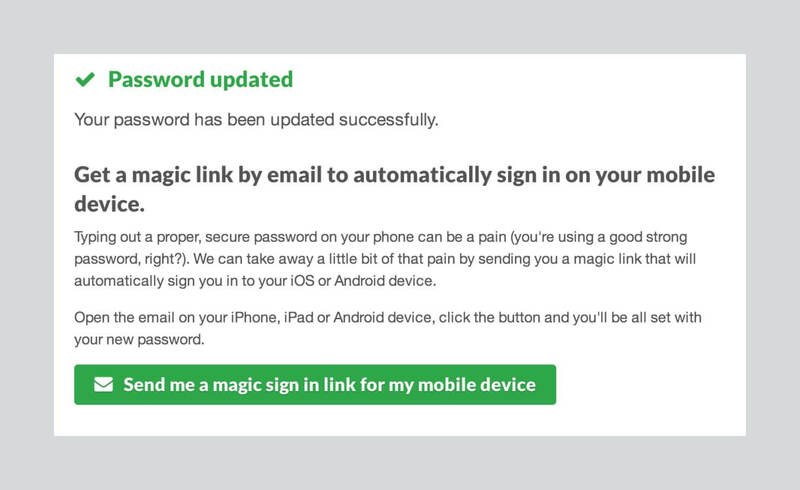 They even think about little things like the magic link as opposed to the password, because they realized new users, the second time they come back, don’t remember their password, and a magic link sounds great. It’s little things like that we can all learn from. Slack’s magic link for password recovery is a small, yet impactful addition for new users. Geoffrey: Do you think the first mile is much different for consumer products vs business products, or do the same principles apply? Scott: The same principles definitely apply. It’s a mistake that almost the entire venture capital community still makes in the sense that they feel like consumer products need a certain type of investor with a certain type of sensibility. Then an enterprise product investor really needs to focus on other things, not the product user experience. I disagree. These days most of these enterprise products are being adopted from the bottom up. They’re being adopted by the teams themselves rather than IT people. At the end of the day, their users also use iPhones and modern-day social products. They have the same level of expectation in terms of ease of use and access. It’s important to treat every product as a consumer product to some extent. Geoffrey: Something we’ve had to deal with at Intercom as our features and user rates have grown is keeping our product as simple as possible. What advice do you give startups when it comes to maintaining simplicity over time? Scott: You guys do this quite well too. To maintain the simplicity, it really comes down to allocating a certain percentage of your energy on an ongoing basis to that first mile experience. Rather than moving on from it once you think it’s working, keep coming back to it, auditing it and refining it. New users change over time. New batches of new users are different because your product may now have more credibility in the industry and you may now be engaging pragmatists – people that haven’t had as much experience with your product before or your industry as the early adopters – and they’re going to have different expectations in that first mile. It’s important to constantly optimize that first mile. Geoffrey: You believe that a startup really doesn’t want all of its customers right away. Talk me through that. Scott: The intuitive logic is that you want any customer you can get. There’s some truth to that. When you take a step back and start to think about where your product is now, where it’s going to be in the near future and where it’s going to be in the longer term, you start to actually become a little bit more discriminant about which customers will serve your business the most. In the very beginning, you want customers that are so interested in what you’re doing they’re willing to tinker through some beta and have a tremendous amount of patience. They’re willing to test something. It’s a small number of customers. Often times if you keep your aperture on those customers, you will not have to explain or handhold too much. These are just the right people to adopt in the early stages. The next type of customer you want is someone who’s forgiving, someone who might be a little less willing to tinker. If there are bugs, they’re forgiving. You’re not going to lose all of your credibility in their eyes because of something that’s not working perfectly. As you start to grow beyond the beta and include more people, you want people that are forgiving. You don’t want the super influential people in the industry who know everyone to be trying you, because they might tell everyone before it’s really ready for full-time, and people who are not forgiving will join and not have a good experience. You have willing people. Then you have forgiving people. Read Scott’s post, “The right customers at the right time”. The third type of folks you want once you’re really ready to have your product spread and you don’t need people to be forgiving anymore is the viral people. These are the folks who will tell a lot of people very, very quickly. A lot of teams when they launch make the mistake of trying to get these people right away. The viral folks will spread the word, but their reputation is at stake. If your product is not really ready or it ends up having some major problems after a viral person engages, it could actually backfire. You want to be careful of that. After the viral folks have really taken their role in spreading the word and being excited about being the first person in their community to talk about a new product – that’s the incentive for the viral person to engage – then you want to start focusing on the lifetime value users. The people who are going to move the needle for your business from a revenue perspective. This is where you start to think that user who comes in and checks it out and then leaves or tries it once is not as important as the person who actually engages and we can retain over time and really drive value out of. This is where that lifetime value becomes important. You’re thinking about what you’re willing to spend to get these new users and optimize for users that stick around and really reward your product. 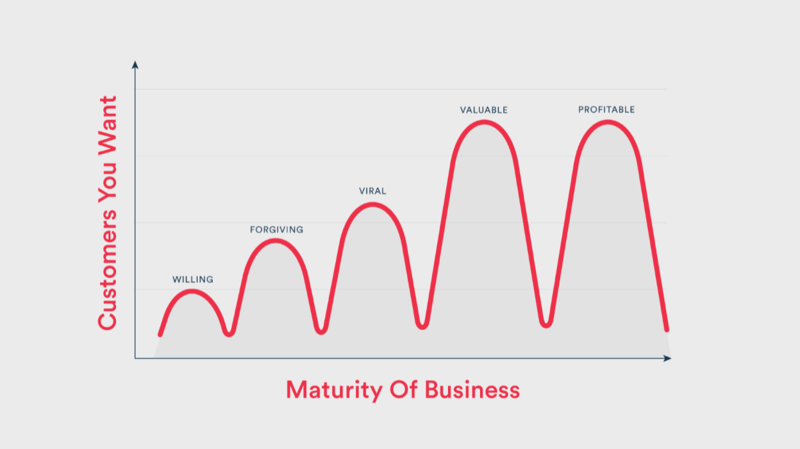 The last type of user you want to get in the very late stage of a business is the profitable user. Sometimes when a company gets older and very mature, you start firing customers that may use a ton of your resources and are not as profitable as others. It’s interesting that at that stage of a business sometimes fewer customers paying a lot more is the goal. The problem there is those companies stop engaging viral people. They stop pushing new risks in their product that people need to be forgiving of. That’s where the cycle starts all over again and the new company can come up with a totally new offering and be competitive. Geoffrey: Most startups are just happy to have anyone, is that what you find? More often than not, companies launch before they’re ready. Scott: I think that that’s the case, but I really believe that the long-term, intelligent approach is to test your product with a very small number of people even if more people want to get in. Then, only actively target people that are forgiving and then only actively target people that are viral. More often than not, I see companies launch before they’re ready. I see products fail not because they weren’t great ideas, but because the execution wasn’t dead on yet. That’s why often times the one that wins the industry is like the third or fourth to market. Geoffrey: Much of your career has been spent discussing creativity and generating ideas. How do you avoid the project plateau, which is in a nutshell is having so many ideas that you end up running out of steam? Scott: The project plateau is the reality of every journey, right? When you start on something new, energy and excitement is extraordinarily high. You’re willing to take a risk. You’re willing to quit a job. You’re willing to stay up night after night after night, and then you end up falling into the doldrums of project management. Real life catches up with you and you realize, “Oh, goodness. What a dreary place to be.” The greatest way to escape that feeling is to come up with another idea. Staying engaged in that journey, not abandoning the hard work for something new and novel, is really critical. Something every creative, energetic person struggles with is staying engaged and sticking with that project plateau rather than just escaping it with a new idea. I suffer from that myself. What I do and what I encourage all teams to do is hack their own reward system. Try to find a way to trick yourself into feeling like you’re making progress when you aren’t yet and staying in the journey long enough to start seeing the light of day. Geoffrey: Scott, thanks a million for joining us. Scott: It’s a pleasure. Thanks so much for having me.